Goals from David McDaid, Derek Daly and Dean Walsh secured all three points for Waterford FC after a 3-1 win at home to Athlone Town on Friday night at the RSC. Waterford FC will be hoping to move a step closer to the Promised Land when they entertain Athlone Town on Friday evening with a 7.45pm kick-off. 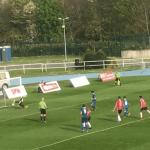 A last-gasp Charlie Heffernan penalty save helped the Waterford FC U17s into the semi-final of the Mark Farren Under-17 Cup after a 2-1 win versus St Patrick's Athletic on Wednesday evening. A selection of photos from photographer Noel Browne from Waterford FC's 4-0 win against Cobh Ramblers on Friday night at the RSC. 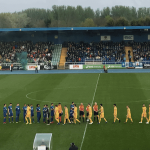 Waterford FC moved nine points clear at the top of the SSE Airtricity League First Division after an emphatic 4-0 won over Stephen Henderson's Cobh Ramblers at the RSC on Friday night. Waterford FC welcome Cobh Ramblers to the RSC this Friday as first place faces second place in a crunch SSE Airtricity League First Division tie at the RSC – kick off 7.45pm.